but were too wise to ask. * When did you start making socks? Did you teach yourself or were you taught by a friend or relative? or in a class? Shortly after I learnt to knit (not sure of the time-frame) and I taught myself the hard way! * What was your first pair? How have they “held up” over time? See image below. 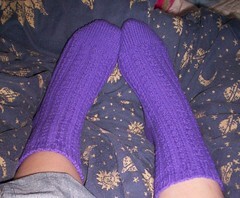 Made from Sirdar Sorrento, I hardly ever wear them because they are cotton/acrylic. My feet don’t like cotton/acrylic socks. I now use them as bed socks/boot liners/emergency dusters. Erm, picked a decent wool-containing yarn? My second pair (for my mum this time) were equally disasterous, but bless her, she wears them! * What yarns have you particularly enjoyed? * Do you like to crochet your socks? 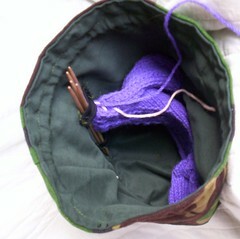 or knit them on DPNs, 2 circulars, or using the Magic Loop method? I’ve seen crocheted socks, but I kind of assumed that they’d be all lumpy? I started out with aluminium double points, then moved on to aluminium circulars (for 2 socks on 2 circs mostly), and then back to dpns of the bamboo/birch variety. * How many pairs have you made? Erm…give me a second. One … two … excluding slippers and the like, about 10 pairs. Including slippers and whatnot about 14 pairs. Two FOs for the price of one! For more views, go to Flickr using this link here. Modifications: Adjusted for my various sizes. Shortened the cropped trousers by about 8 cm (approx. 3.5″) to make them “longs” rather than shorts! Notes/comments: Even after I cut the waist to the smaller size, it was still too big and I had to take it in by 3 cm. Even now, they are a loose, relaxed fit, but this is OK because they make for very comfortable “longs”. With thanks to Siliva and Becky for the inspiration. Click on any of the photos for a larger view (external link to Flickr, as usual). Yarn: ZwergerGarn Opal Cotton in “Lollipop” (strange colour for a lollipop!). 48% cotton, 39% new wool, 13% polyamide (Nylon). 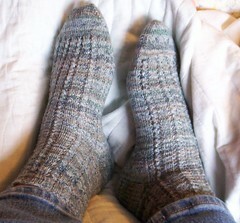 Pattern: Simply Lovely Lace socks by Karen Baumer from the Spring 2006 edition of Interweave Knits. Needles: 2 mm bamboo double pointed needles. Modifications: I changed the stitch pattern to eliminate the twisted stitches (I was having none of that) and modified the toe to end on 24 sts instead of 12 (it fits my toes better). I also increased the size of the sock (see next point). Notes/Comments: These were originally intended for my mum (hence the dour colour) but despite increasing the size of the sock there is no way on this Earth that they were fitting my mum. They only just fit me (they are a bit tight). I may do these again (although I doubt it) and if I did I’d definitely do the sport weight version instead. The majority of the problems came from my too-tight tension/gauge and not the pattern itself. Click on any of the photos to go to Flickr where you can view larger versions and see more of my photos. Yarn Source: A Secret Pal 3 “Angel”. Needles: 3.25 mm and 3.5 mm Brittany Birch double pointed needles from Elann. Cast off/toe/heel: sewn/short row/toe-up with heel flap. Modifications: I changed it to toe-up using these instructions. Comments: This is a very well written, excellent pattern (I’m a little bit affiliated, because I read Kristi’s blog, she mine and I won this pattern in a competition she ran!) you can find here. Pattern: A tutorial over at craftster. The result? : My mum loves it – yeah! And that includes me! I’ll be standing in a field/in a stream/on a mountain for the next seven days and I don’t think I’ll have internet access. I’ll try and post if I can, but no promises! In the meantime, learn all about Shropshire here! A slight bit of information for those not familiar with the Open University‘s way of working. The normal academic year (in England, anyway) runs from September to about July. However, the OU is from February to October. This has meant that I’ve done most of my work for my degree during the long, hot days of summer. However, it has been an advantage for crafting coming up to Christmas/my brother’s birthday/my birthday. Whilst I’m gone, I’ll turn word verification back on. Since I turned it off, I’ve not had any really bad spam attacks, but I’d rather have some kind of protection in place when I’m not here watching it like a hawk! 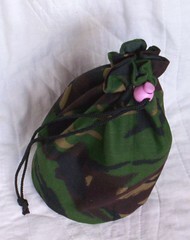 Yes, I know the toggle doesn’t really go with the camo fabric, but I think it’s very ME! EDIT: The pieces I used were an 8 cm radius circle and a rectangle of 44 cm by 24 cm. I used a 1 cm seam allowance throughout. I also used some metal eyelets and nylon cord for the closure. The black bits are two pieces of elastic I used to keep the double pointed needles together. For bigger pictures, you know the drill (click, click!). There are two more photos of the bag here. 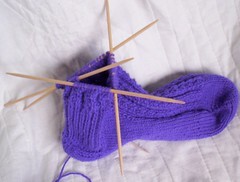 And progress on the sock?